Because smart meters collect and transfer electric use data back to the power company in 15 minute intervals, consumers now have the advantage and ability to remotely monitor their own power consumption. Remote management of power consumption allows consumers to make smart decisions about their usage that will ultimately save both power and money. 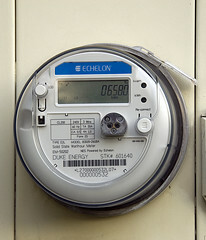 Smart meters not only have the capability to record the amount of electricity consumed, but they also record surplus electricity generated by distributed generation sources such as solar panels and wind turbines. As alternative energy becomes more and more popular, being able to sell excess power back to the grid is a huge benefit. So get your smart meter installed and start remotely monitoring your power consumption, receive accurate monthly billing, and enable your ability to sell back excess power generated from alternative energy sources, such as wind turbines and solar panels. Do you have a smart meter? If not, call your power company and ask about getting one today. Update: I had my smart electric meter installed last week. My power company requires 90 days of data collection before allowing me to monitor my power consumption, so watch for future articles in which I will describe my findings. This entry was posted in Alternative Energy, Sustainable Living, Technology and tagged Alternative Energy, Renewable Energy, Solar energy, Sustainable Living, Technology by Todd Bryan. Bookmark the permalink.